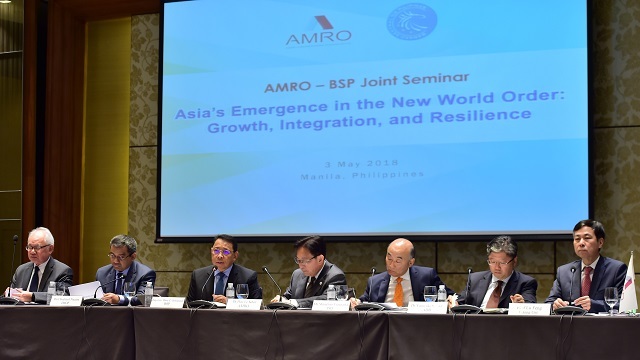 MANILA, PHILIPPINES, May 3, 2018 – ASEAN+3 economies, after experiencing much growth over recent decades, are facing challenges posed by global forces including changes in technology, trade, and production networks. 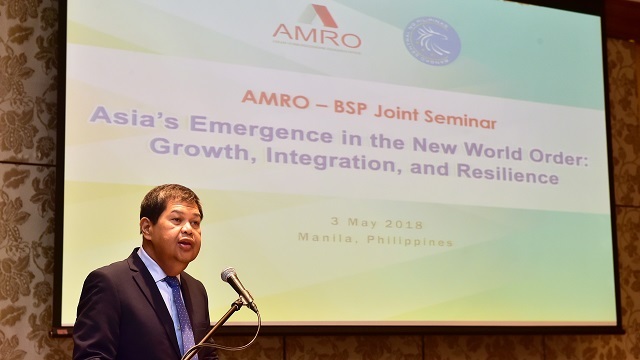 The ASEAN+3 Macroeconomic Research Office (AMRO) and Bangko Sentral ng Pilipinas (BSP) in a joint seminar today discussed ways the region could rise to challenges, enhance productivity, and continue with their growth pace. 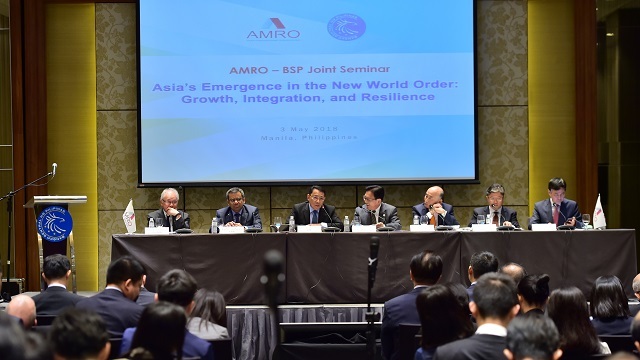 With the theme “Asia’s Emergence in the New World Order: Growth, Integration, and Resilience”, the seminar presented key findings of the ASEAN+3 Regional Economic Outlook (AREO) 2018 to set the context for discussion. Prominent speakers and participants, including high-level policymakers, leaders of international organizations, and renowned academics, shared their insights and perspectives during the discussion. AMRO Director Dr Junhong Chang speaks at the seminar. SP Governor Nestor A. Espenilla, Jr. speaks at the seminar. Meanwhile, in his welcome address, BSP Governor Nestor A. Espenilla, Jr. remarked that the core of the ASEAN+3’s successful growth story was globalization which paved the way for greater trade openness and economic integration in the region. For these growth engines to continue to pay off amid global uncertainties, there has to transpire a seamless fusion between conventional growth models and forward-looking strategies aimed at ensuring sustained economic resilience in a technology-savvy future. He also shared the view that the joint seminar will provide ASEAN+3 economies with broader insights in dealing with contemporary challenges and a stronger consensus in fostering deeper regional integration as a critical strategy to reduce external vulnerabilities and sustain its standing as an economic powerhouse in the new world order. The panel discusses key issues on growth and resilience in the ASEAN+3 region. From left to right: Dr Bandid Nijathaworn, President and CEO of the Thai Institute of Directors; Mr Suahasil Nazara, Head of Fiscal Policy Agency, Ministry of Finance of Indonesia; Mr Diwa C. Guinigundo, BSP Deputy Governor; AMRO Chief Economist Dr Hoe Ee Khor; Mr Mitsuhiro Furusawa, IMF Deputy Managing Director; Dr Yasuyuki Sawada, ADB Chief Economist; and Professor Lu Feng of National School of Development, Peking University. The panel noted that the region has successfully pursued a strategy of “manufacturing for exports”, whereby economies benefitted from export-oriented foreign direct investments (FDIs) to build up manufacturing capacity. While this boosted economic growth, employment, productivity, and wages over the past few decades, it has been put to test by trade protectionism, changes in trade and production networks, and technology. The panel agreed that the regional policy response against these challenges should be to deepen intra-regional integration, while developing resilience and competitiveness. In particular, the latter can be enhanced by improving connectivity in domestic and intra-regional infrastructure, coupled with regional efforts to facilitate cross-border trade. The panel considered the impact of technology and automation in the growing services sector, which gives rise to both challenges and opportunities in ASEAN+3 economies. While technology may have reduced the demand for labor in manufacturing, it has also facilitated the emergence of services as a potential engine of growth and employment. Leveraging on services sector growth to create skilled jobs, however, requires investment in labor policies and education. The panel agreed that the region’s growing intra-regional demand, ample resources for investment in infrastructure and social sectors, and diversity in factor endowments are sources of strength. While the region remains open to global trade and investment, leveraging on intra-regional demand would improve the resilience of the region as a whole. The Bangko Sentral ng Pilipinas (BSP) is the central bank of the Republic of the Philippines established as the country’s independent central monetary authority. The BSP is responsible for maintaining price stability through sound monetary policies that are conducive to a balanced and sustainable growth of the economy. Towards this end, the BSP manages liquidity and money supply as well as ensuring sufficient international foreign currency reserves to preserve international stability and convertibility of the Philippine peso. The BSP is also charged with maintaining financial stability through the conduct of effective supervision of banks and other financial institutions to ensure a sound and stable banking system. The BSP ensures the safe, timely, and accurate payment and settlement of financial transactions as the operator of the country’s real-time gross settlement (RTGS) system or the PhilPaSS. The BSP is deeply involved in various projects and activities aimed at alleviating poverty, contributing to the global fight against money laundering, increasing transparency of monetary policy, and improving the financial literacy of the public. In line with poverty alleviation, the BSP undertakes sustained efforts in promoting financial inclusion as a way of bringing the financial system closer to all Filipinos, especially to the financially underserved and unserved.